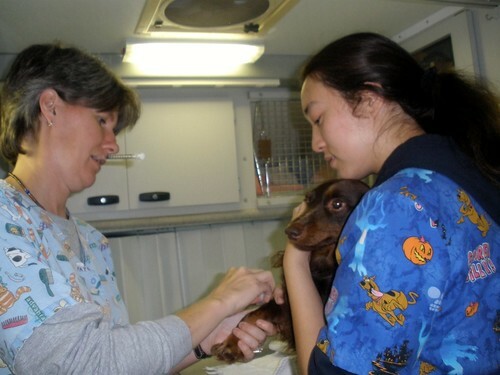 The role of the vet is one of high stress, high responsibility and high reward. A lot of training and studying goes into becoming a vet and not all that go down that avenue are successful. A vet is not a person who simply attends to sick animals. He is also the person who has to put the sick animals to sleep. He is the person who cleans up the neglected animals and he is the person that has to with a distressed and vicious animal who needs his help. Of course this job can be highly rewarding but it can also be highly distressing. Anybody wishing to pursue a career in veterinary surgery should recognize that early planning is essential. A good set of G.C.S.E. results are needed so that the candidate can go on to take the relevant A-levels. Excellent A-level results are required in two science based subjects, a maths based subject is preferred and one other subject is also required. An honours degree is the next step. Only six universities in the United Kingdom offer courses in subjects leading to a veterinary degree. They are, Bristol University, Cambridge University, Liverpool University, Edinburgh University, The University of Strathclyde in Glasgow and Imperial College, London. It is important to note that the courses that these institutions offer are subject to change, so it is important to refer to the U.C.A.S. handbook. Even if a student earns a first class honours degree from one of the above institutes, it does not mean that they automatically become a vet. Quite often supplementary training is required for vets wishing to specialise in certain areas. Certain surgeons prefer to work with certain animals, others prefer to work in certain areas of vet surgery such as anaesthesia or cardiology. But the main job of any vet is to help any animal in need of any emergency treatment and all vets will be qualified to cover a broad base of procedures. Other attributes that a vet will find invaluable include a good state of physical health and fitness. The industry also demands that a vet be mobile, so a full and current U.K. driving licence. Business skills are useful, especially if the vet is wishing to set up his own practice. Good communication and social skills will be needed, a vet will inevitably have the unenviable task of telling a person that their pet will need to be put to sleep. This needs to be done in a sensitive yet clear way. This skill can only be acquired through time. Being a veterinary surgeon requires huge amounts of dedication, experience, professionalism and hard work. But the rewards can be huge. A vet can receive the satisfaction of saving the life of an animal, the salary of a vet is usually very high, but so is the work load.